The National Governance Association is pleased to see an updated version of the Department for Education’s Governance Handbook published today. It is the ‘go to’ document for those of us working with governing boards of both local authority schools and academy trusts, and the corrections were well over due. 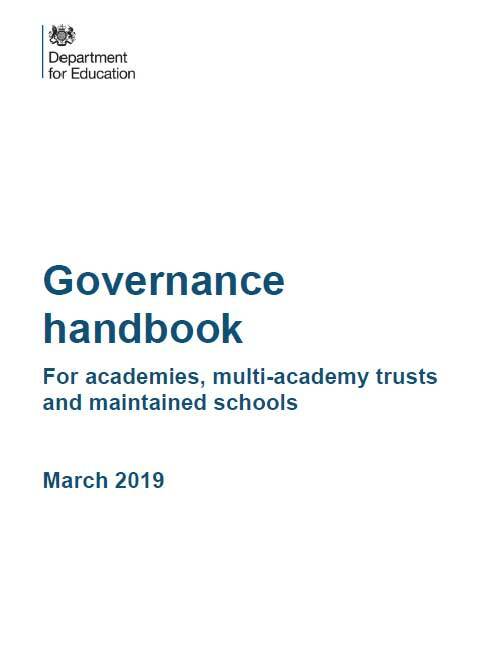 However this edition is a missed opportunity; in the eighteen months we have been waiting, we have urged a more fundamental review of the governance roles, particularly as regards academy trusts where there can be a lack of understanding. The DfE have told us that another edition of the Handbook later this year will do this. For a couple of years now, NGA has been championing a fourth core function for all governing boards of engaging with the school’s stakeholders, and will continue to have conversations with the DfE about this. There still remains some confusion about the role of members in some academy trusts, and unfortunately, the Handbook does not clarify, but continues to use the incorrect phrase ‘eyes on, hands off’. This is a phrase that comes from me, one which the NGA team use widely, and a phrase used by other sectors to describe the role of the board of trustees/directors. It was also brought into wider use in the schools sector by the last HMCI in his governance blog, but to illustrate the role of governing boards in terms of the strategic, not the operational. To continue to use the phrase in the incorrect context is unhelpful, but there is now a well-used resource that adds a much greater clarity: NGA’s own guidance on the role of trust members published last year has been welcomed by many, including the minister Lord Agnew. The NGA is extremely pleased that Lord Agnew accepted our suggestion that the DfE needed a strategy to support the improvement of governance, and that one is now in the process of being developed. We will continue to work with the DfE and to ensure that the wider world of governors and trustees are involved. The section on Parental Engagement and Community Leadership has been reinforced, particularly in respect of Parental Engagement. New paragraphs on workload considerations with a workload reduction toolkit. A new section reinforcing robust oversight of a school through mandated meetings and quora. Replacement of RAISEonline with information on Analyse School Performance. Clarification on criminal records checks and s128 prohibition. Updated text to reflect the clerking competency framework, funded clerking training and the position of a clerk (governance professional) in trusts. Clarification on LA associated people (LAAPs) serving as Members. Clarification on what a maintained school must publish in relation to the curriculum. Updated text to highlight the future proposed changes being made to SRE. Updated guidance following the introduction of statutory Careers guidance, which came into force in 2018. Updated advice on information the board should check as part of the pre-appointment process when recruiting potential employees. Removal of text on NTCL teacher services. A new subsection on Executive pay. Updated text to reflect changes to the Dedicated Schools Grant and the pupil premium. Updated guidance to provide further clarity on the board’s responsibilities under safeguarding. Clarification that the statutory duty to produce and publish a statement of principles applies to maintained schools. Updated guidance on school food and milk which reflects the updating of entitling benefits for Free School Meals and outlines the board’s responsibilities to ensure the school is complying with its obligations. Updated advice to alert schools to their fire safety responsibilities. The inclusion of an additional paragraph on the responsibility of schools to ensure that any provider of childcare on site must have in place appropriate policies in relation to safeguarding children. Clarification on dealing with complaints. Updated to include reference to DfE funded governance development programmes and the clerking competency framework and Ofsted “myths” documentation. Updated content on schools causing concern and on coasting schools. Update to include DfE areas of support and other information which may be of use to boards.